Cave to Co-op is a partnership among the Neighboring Food Co-op Association (NFCA), the distributor Provisions International, and New England’s artisan cheesemakers. Over the past five years, this program has moved 14 tons of regionally produced cheeses at an affordable price. Check out this month’s special HERE. The goal of Cave to Co-op is to contribute to a stronger regional food system by introducing local cheesemakers to consumers and encouraging them to try their products. Each month, a new cheese is featured in the program, accompanied by a newsletter article and other promotional materials on the producer. Through the joint effort of these cheesemakers, Provisions International and the member food co-ops of the NFCA, thousands of pounds of cheese have been sold and enjoyed by hundreds of local consumers. Organic Champlain Triple (Vermont). A beautiful soft ripened triple créme cheese with a bloomy white rind. A great addition to any cheese plate, made with milk from Journey’s Hope Farm in Bridport, VT, near the shores of Lake Champlain. Landaff (New Hampshire). Landaff Cheese is a mild, semi-firm farmstead cheese made from raw cow’s milk in the Welsh tradition. It melts beautifully for cooking and is a great addition to a cheese plate. Landaff is produced by Springvale Farms, which also produces milk for the Agri-Mark co-operative. Hubbardston Blue Cow (Massachusetts). A surface-ripened blue cheese that develops a very soft and creamy center upon ripening. A perfect holiday cheese that goes great on crusty bread. Produced by Westfield Farm in Hubbardston, MA. 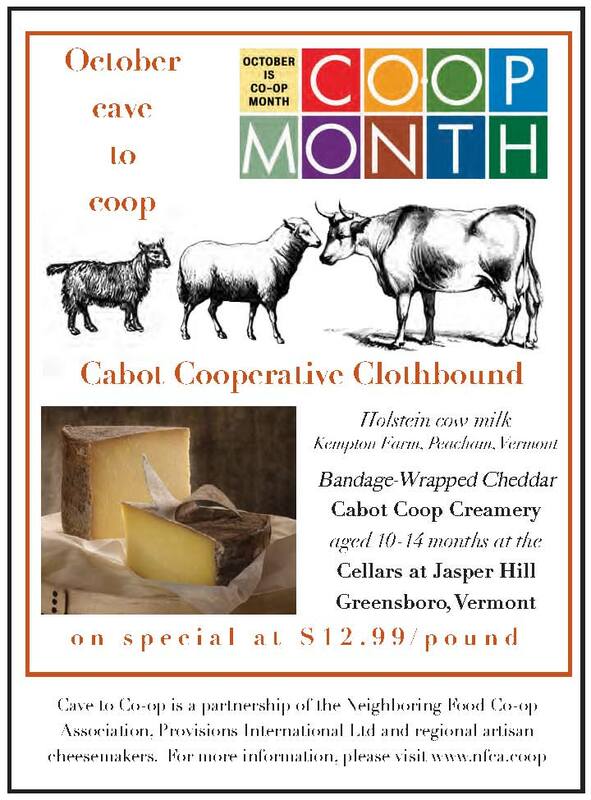 Cabot Co-operative Clothboound Cheddar (Vermont). Best enjoyed on its own with a slice of crisp apple or pear, this delicious English-style clothbound cheddar was producedby Cabot Creamery Co-op in collaboration with the Cellars at Jasper Hill in Greensboro, VT.
We hope you will try some new cheeses and get to know the people who make them. Look for the Cave to Co-op logo in the cheese case at your local NFCA member food co-op for this month’s offering! May 2016: “Crawford” from Twig Farm, West Cornwall, VT.